dailyyellow | Hello Pretty. Buy design. Guys. No but guys. Look at these yellow cats. Are they not the best? Fathima, fellow cat lady from Happiness Is... has done this most amazing illustration for this months #WDC2014 inspired downloadable wallpaper, and we LOVE it. Can you tell? Download this bit of tech sunshine for free over HERE. Talented right? She's so brilliant. You should all go visit her Hello Pretty store right this second! Check out our past wallpapers over here. Yayayay! It's that time again - and this time, we have the artistry of Terry Angelos for you all to pretty up your various tech with. Download your free wallpaper over HERE, and visit Terry's Hello Pretty store over here - you won't regret it! At the Miss+Meisie Showcase and I Heart Market in Durban - gorgeous right? In the Homeology and D&M Made With Love DIY and Styling ebook, available here. Stunning! And the best part is being able to own a piece of Terry Angelos art free and gratis. Get downloading, and tag us in pics of you and your new fancy computer wallpapers! We loved last months WDC2014 inspired downloadable wallpaper so much, that we're doing it again! Gorgeous or what? It's so hard to choose a favourite! So guys, it's no secret that we are privy to some pretty fantastic talent here at Hello Pretty. South Africans have some mad skillz - and we're super proud of being able to support them, see and help them grow, and revel in their general awesomeness. One such human is Jeanine from Love Mary J - this lady specialises in geometric, linear inspired illustrations that will just knock your socks off. We were lucky enough to have her treat us to a really gorgeous, illustrated World Design Capital inspired downloadable desktop - cool huh!? 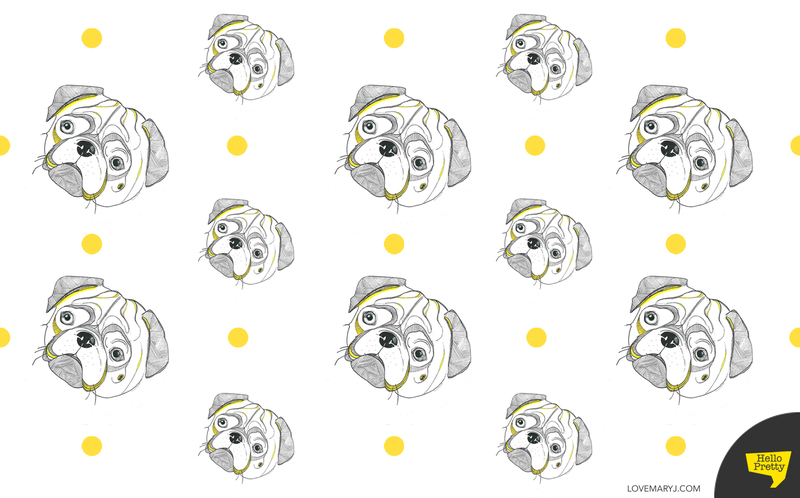 AND it involves pugs and polka dots. I mean, if that's not a recipe for success, I don't know what is. So you should all check out her Hello Pretty store here, (especially her pet portraits) and download this super fun wallpaper right over here. Read more about #WDC2014 Desktop Wallpapers! If you follow us on Instagram, Twitter or Facebook, you would have seen us jumping into the spirit of World Design Captial feet first. We all agreed that this is an important year for everybody, whether you were a recognised project or not. It's so easy to get involved, even in a tiny way. And so we set out to inject a teensy bit of yellow into our daily lives. And as we've been going along, we've been thrilled to see people jumping in - tagging us in something yellow that brightened up their day, or sending us yellow inspiration. It's the most satisfying feeling to have people interacting with us in that way - all of a sudden this small thing becomes much bigger and more exciting. We're not changing the world, but hopefully it brings a smile to the faces of the people who see it, and in turn directs them to the collective awesomeness that is WDC2014. I recently received an email from Nadia, the talented illustrator and maker behind Bvbblegvm, saying that she had made us something yellow, which was just so exciting. Is this not amazing? Not only is it pretty, yellow, and generally fabulous, it imparts some solid wisdom as well. Shorly after that I received an email from Nikita from Didzy Designs saying that she had designed some new phone covers to join the yellow madness and I just broke into a huge cheesy smile. I'm just so excited by everyone joining in. 365 yellow photos is no small feat! We value the encouragement and support so much, and so far we have yet to resort to photos of bananas. Some sweet found #dailyyellow inpiration from Stacey of The Love Bucket and a snapshot in the life of Andrea Jane. So thank you Nadia, Nikita, Stacey, Andrea and to all our followers that encourage our mini project - we'll be sending a lot more yellow your way! If you were to ask us what we like better - good design or good coffee, we'd find it extremely hard to give you an answer.